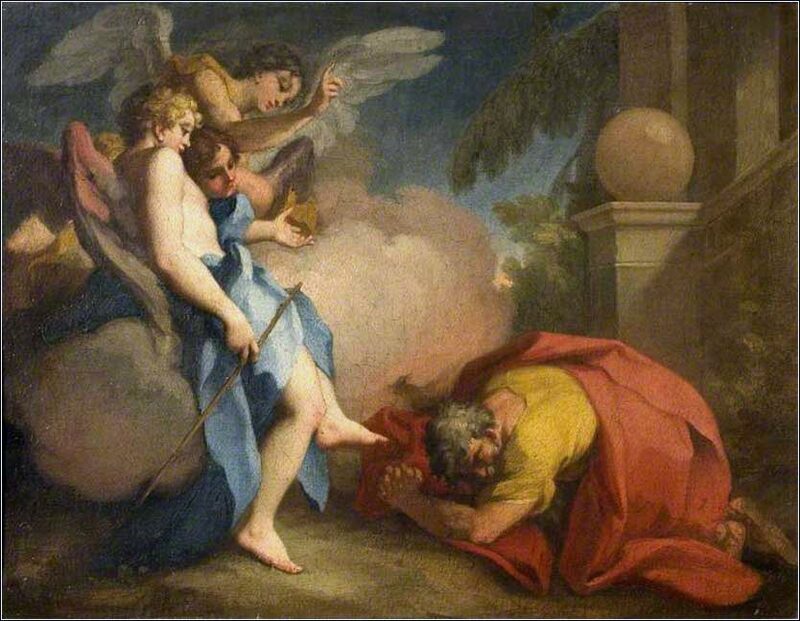 Abraham Visited by the Three Angels by Antonio Balestra, ca. 1716. For everybody who has told us they like to sing along. 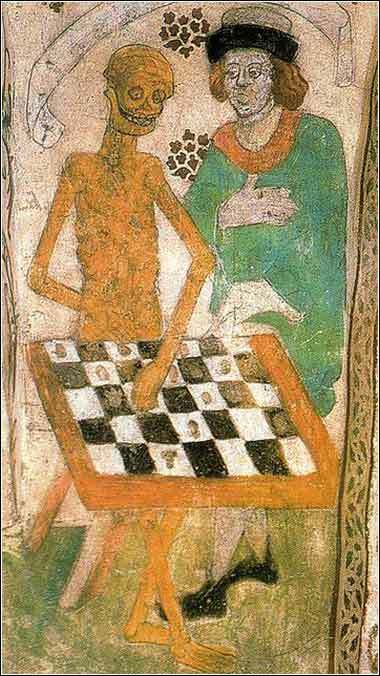 Death Playing Chess, mural on the wall of Taby Church, Uppsala, Sweden, by Albertus Pictor, ca. 1480. This mural was the inspiration for the chess scenes in Ingmar Bergman's haunting movie, The Seventh Seal. “We are sons of the Nephthalim (that is, the tribe of Naphtali), captive in Nineveh,” they explained. “Know him? He is my father!” Tobias told him. “And he is alive and well, except that he has become blind from a white film over his eyes.” Raguel jumped up, and kissed Tobias, and began to weep — from joy to see Tobias and from grief at his kinsman's blindness. “A blessing on you,” he said, “for you are the son of a good and honest man.” And the women wept also. And when Raphael (Azarias) had told Raguel that Tobias wanted to marry Sara, Raguel replied to Tobias: “Eat, drink, and make merry. For it is right that you should marry my daughter, but I must tell you, in all truth, that I have already given her to seven men, and all of them died on their wedding night. So be satisfied with a good meal.” But Tobias refused to eat a crumb until the marriage should be agreed; and Raguel could not refuse. And he blessed them. Then with Edna his wife he took a paper and wrote on it an writing of covenants, and they both sealed it. There is nothing that needs to be said about this chapter from Tobit that has not been said in previous comments. Today's passage is pure fun; it reads like a romance novel. Will our young lovers find happiness in their bold marriage? Or will they be thwarted, and young Tobias killed, by the evil Asmodeus? Since the primary Scripture needs no commentary, we might spend a moment thinking about one of the most vexatious issues in Christianity: faith vs. works. There is a good passage on this subject in today's Daily Inspiration, written by the eminent theologian R. C. Sproull. I would recommend that every Christian read it and reread it until it is fixed in their mind. It Not because we actually need to understand it, but rather, so we don't get confused when somebody starts talking nonsense about it. This makes for quite a pickle for theologists. How can we harmonize Paul, who in Romans and Ephesians seems to say that we are saved by our faith despite our sin, and John and James — or for that matter, Christ himself (e.g. Matthew 7:21-23) — who seem say that if we keep sinning we do not have true faith and thus are not saved? One way is just to ignore theologians. Nowhere in the Bible does it command us, or even authorize us, to develop a logical construct for God's plan of salvation. Christ calls us to obedience, not theology. Unlike theology, Christ's commandments can be understood by anyone with an open mind. He did not come to earth to save smart people. He came to save anyone who would open his heart in faith. And when we do sin — and I don't know anyone who even comes close to avoiding sin completely — we don't need to worry whether or not we are “saved”. We need to confess our sin, ask for forgiveness, and reform our conduct and our thinking; before a priest if we believe in sacramental confession, in our room if we believe in direct absolution from God. Whether you want to say that we are justified by faith alone, or our faith is shown in our works, or whatever, our behavior is the same. We must try with our full heart and mind to follow Christ's commandments.